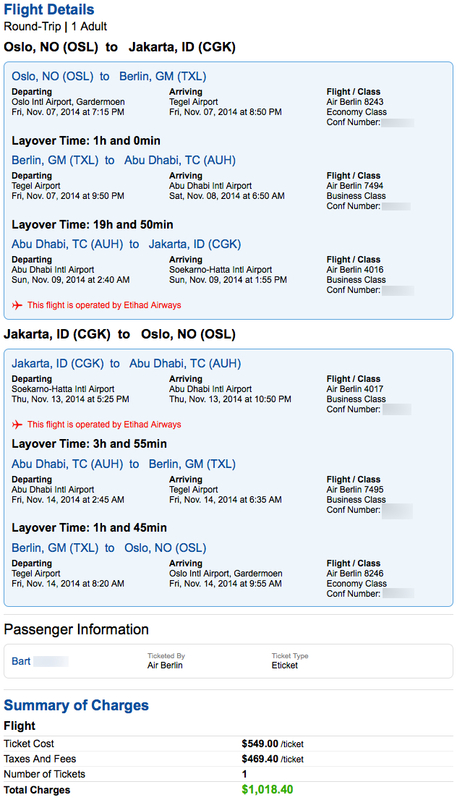 Mid October, Air Berlin published a really cheap Business Class fare from Oslo, Norway to Jakarta, Indonesia. An opportunity I used to try their new Business Class and to visit Bali. The fare from OSL to CGK via TXL (Berlin) and AUH (Abu Dhabi) was $1018 (€818). 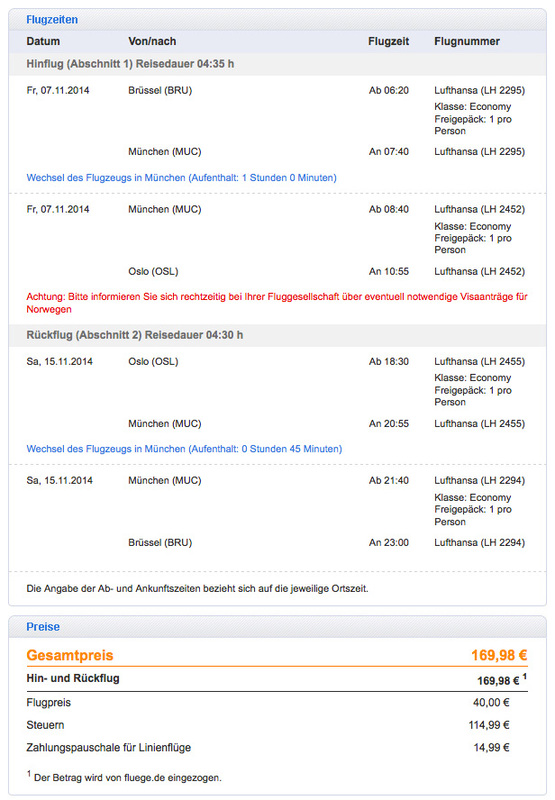 For the positioning flight, I booked Lufthansa via Munich at €170. The first leg of the Air Berlin ticket wasn’t really exciting, as it was just a short-haul ‘all economy class’ flight from Oslo to Berlin. The layover at TXL airport was only 1 hour, so I didn’t visit the lounge. In fact, there wasn’t much time to do so, as I had to change terminals at TXL. An annoying experience as you arrive at the ‘temporary’ low-cost terminal C and need to walk outside to terminal A. Unfortunately, it might take another 5 years before the new Berlin Brandenburg Airport opens. Anyway, I was glad to board the Air Berlin A330! The Air Berlin Business Class seat is very similar to Etihad’s Business Class product. The main differences are the color scheme (obvious), seat pitch and bed length. With 59 inch (150cm) seat pitch at Air Berlin versus 73 inch (185cm) at Etihad and 71.3 inch (181 cm) bed length at Air Berlin versus 73 inch (185cm) at Etihad, taller travelers might prefer the Etihad seat. My Air Berlin A330 flight had a different Business Class configuration compared to the one seat map you find online. I was in seat 2K which doesn’t exist on the SeatGuru map, but in fact was the right front row seat with a lot of extra space in front of it. Not sure what triggers this different Business Class cabin layout. The crew on the outbound flight AB7494 from Berlin to Abu Dhabi on Nov 7 was outstanding. However, I had the opposite experience on the inbound flight AB7495 from AUH to TXL on Nov 14. I’m used to this on Turkish Airlines flight, were crews are a hit or miss. Future Air Berlin flights will tell me if they have a similar thing going on. My Air Berlin flight arrived early in the morning at Abu Dhabi airport where I was lucky to shoot this awesome picture of Ferrari World from my seat window! As I hadn’t visited Abu Dhabi before, I opted for a long layover with 6:50am arrival on Saturday morning and 2:40am departure on Sunday morning. My rate at InterContinental Abu Dhabi was €116 which included 5000 bonus points and breakfast, a stay I needed for my Into the Nights challenge. 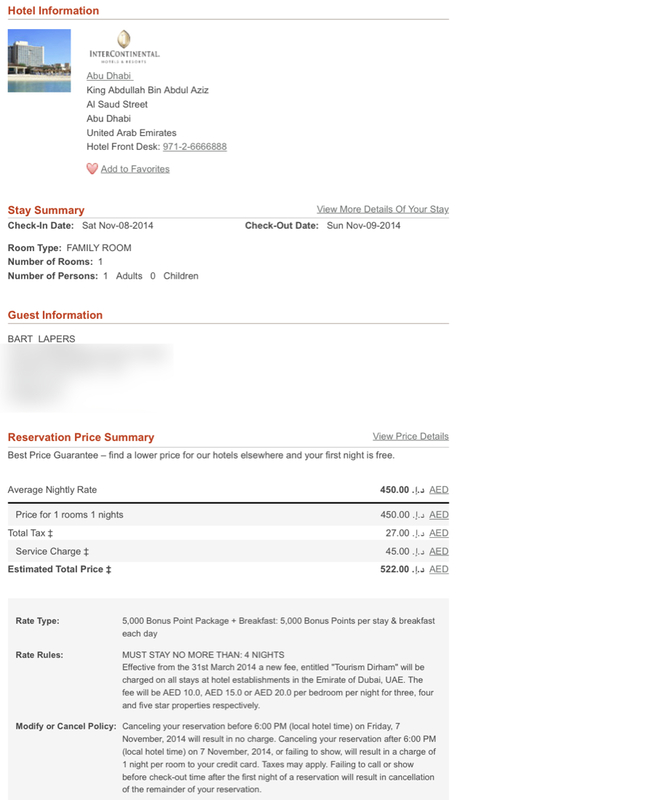 I lucked out with the ‘family room’ rate, as it was much cheaper than regular rooms. Check-in at 8am was no issue, the front desk lady even apologized for not having a Deluxe Sea View room ready yet. Instead I was assigned a Deluxe City View room and granted access to the Club Lounge where I could enjoy drinks & food all day long! After a long but rewarding day in Abu Dhabi, it was time to continue my journey to Indonesia. The final outbound leg, Abu Dhabi to Jakarta, was operated by Air Berlin’s partner Etihad. I had flown Etihad Business Class back in 2012, so I knew I could expect great service. The Etihad Business Class check-in counters were quite busy at Abu Dhabi airport, but before I had a chance to queue, I was ushered to First Class where I could complete my check-in… seated! First thing I did at the Etihad Business and First Class lounge was heading to the Six Senses Spa to make an appointment. Business (menu) and First Class (menu) passengers can choose from a selection of 15 minute treatments, I went for the ‘Back Support’ massage. Surprisingly First Class passengers don’t get longer treatments like the ones I experienced at Thai Airways First Class. Maybe this will change when their new First Class lounge opens in April 2015 at Terminal 3. After some muesli and fresh fruits, I had the Arabic Style Egg White and Tomato Frittata with Halloumi Labneh and Olives for breakfast. Delicious! Overall a great flight with excellent Etihad service as we are used to from Middle Eastern airlines. At Jakarta airport (CGK), I continued my trip on a separate AirAsia ticket to Denpasar, Bali which included Air Asia’s highly recommended Red Carpet service. I used it twice now, once at Kuala Lumpur airport and this time in Jakarta. Actually, it resembles Lufthansa’s First Class ground services… but obviously a less fancy version of it! Red Carpet comes with dedicated check-in counter, personal assistant guiding you through immigration and security, lounge access and….they actually drive you over the tarmac to the plane in a separate AirAsia Red Carpet shuttle! In fact, they had a full busload of passengers waiting for minutes next to the plane, just to make sure I could board the plane first! All this for less than €12 ($15)!!! I really hope AirAsia will keep offering this service as it doesn’t seem to be too popular. It rocks! And of course, there was more of the same great flying on the way back from Indonesia to Norway. With a long layover between my AirAsia flight from Denpasar and the connection to Abu Dhabi, I had to figure out a way to bridge the time gap between my arrival at CGK and check-in opening for AUH at Jakarta Soekarno–Hatta International Airport. Fortunately, I spotted the Taman Sari Royal Heritage Spa at the end of Terminal 2F. The interior was tired and dated, treatments were really expensive, but at least the massage was good and I had the opportunity to take a shower afterwards. Contrary to the outdate Spa before check-in, I found a refreshing Garuda Executive Lounge airside. As Etihad Airways Business Class passenger, you got a voucher at check-in which is valid for a number of lounges at CGK. The Garuda lounge looked the best pick. The outbound Etihad flight was on a Boeing 777-300ER as where the inbound was on an Airbus A330 which had a more recent version of the Etihad Business Class seats with bigger Inflight Entertainment screens and more advanced remote controls. The Food service was excellent and so was the Etihad crew! No showers or massages at the Air Berlin lounge at TXL, but a clean modern self-service lounge with automated access system (swipe your frequent flyer card) and vending machines with complimentary soft drinks. Got to spend a nice, but cold, Saturday in Oslo before returning home with Lufthansa via Munich. Conclusion: I was lucky to get alerted about this great Air Berlin / Etihad Business Class fare via my TravelMagic team and Drew & Carrie at TravelisFree. It was a nice opportunity to experience both Air Berlin’s and Etihad’s Business Class product and got a great stay in Indonesia on top. More about my Bali trip soon! So glad that you visited my home country. Hoping you had a great time here! Anyway, I’m gonna ask you one (maybe annoying?) question. I really like your photograph. Like, a lot! What type of camera did you use in this trip report? I saw a photo of you holding DSLR on your trip to Jordan (if I’m not mistaken). Are you using the same camera here? I’m planning to upgrade my camera so I have to do some research first. Hi Eky, most pictures were shot with my Sony Cyber-shot DSC-RX100 I. The current version 3 (III) of this Sony camera should be even better. A few pictures were made with my smartphone, the OnePlus One. My apologies just saw that TravelMagic team and TravelisFree told you about it.